This is quite possibly the best Assassin's Creed artbook so far. It's a terrific video game artbook. It's a big 192-page hardcover published by Titan Books with most of the artworks are printed big to the page edges. Many concept paintings featured are actually collage of photographs and art. Look closely and you'll see photos erased and digitally manipulated to form the shape and composition required. You might that that the photo and art collage style is cheating. The thing is, they look amazing. As concept paintings, they capture the mood and atmosphere really well. This is in part because the colour values are captured correctly, resulting in a convincing environment. The photo and art collage style when not well done, even by a bit, can result in a fake look. Well, all the paintings in this book look great to me. The end result looks more like art than photos. A nice improvement over the previous artbook The Art of Assassin's Creed III is that details are no longer hidden in shadows. Even when they are hidden, they are done so suggestively, with details fading to vague masterfully. 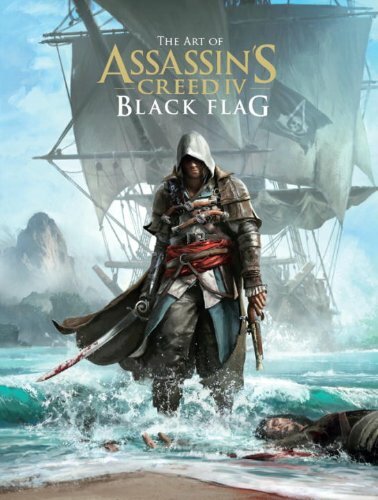 Character designs are mainly of the pirates, and of course of the main character Edward Kenway. Costume designs are really detailed. Who knew 18th century pirates can be so fashionable. Artist Patrick Lambert's rough paintings look expressive and just great. There are lots of environment art. Many of the environment art pieces are inspired by location visits. The design team visited Spanish city Havana in order to create the Havana in the game, a beautiful coastal town that is described by Spanish colonist at "Key to the New World" at that time. It's lively, full of people, activities. There are not just beautiful town houses, but also the poorer middle class people with tattered roofs. The other places are Kingston, a city in Jamaica, or as pirates claim the "Wickedest City on Earth". There's also Nassau, city of Bahamas. For Nassau, there's also a concept art inspired directly by the Queen's Staircase. Other locations included are the fortified shipwreck, fishing villages built on stilts, tropical hideouts, Mayan temples, mangroves and coves, jungles, campfire night scenes and more. Every location has several paintings to convey the idea of the whole place. There's even a whole city designed, Port au Prince, that was cut from the game. At least the art remains in the book. Designs for the pirate ships are detailed, interiors inclusive. There are several ships, namely Jackdaw, Blackbeard's Queen Anne's Revenge, Black Bart's The Royal Fortune, Benjamin Hornigold's The Benjamin, The Governor, The Ranger, Calico Jack, Spanish Man of War and other ships from the British Navy. Yes, lots of ship. And there are also many paintings with pirates working on the deck, big ships, small boats, on fire or blown to bits. There are also scenes from underwater, with submerged shipwrecks, and also sharks with eyes that say "We want to eat you". Ubisoft art team has truly put together some amazing art, and well compiled by author Paul Davies. Highly recommended to those who like concept art and fans of the game. There's also a limited edition of 500 copies. It has two signed art prints by game artists Martin Deschambault and Vincent Gaigneux. The cover is different and there's also a slipcase.